Maya is illusion and that is exactly what this Vashikaran Mantra is said to do, put everyone under an illusion and make the practitioner appear attractive and enchanting to him or her. 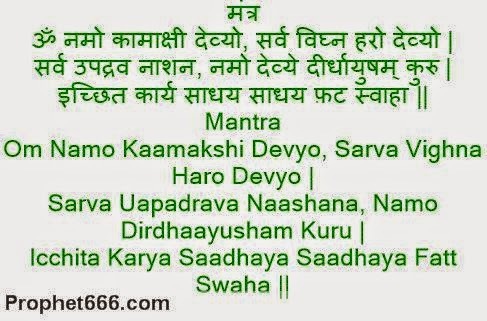 The Vashikaran Mantra is dedicated towards the Goddess Kamakshi, a form of the Divine Mother; hence, this is Shakti Mantra Sadhana, which can be performed by both male and female practitioners of the Vashikaran and Mohini Tantra. The Mantra Sadhana has to be performed for 41 days and during this period the practitioner has to chant the Mantra for 41 Malas every day. The Tantra given below has to be followed everyday for these 41 days. The practitioner has to keep 41 sand pebbles besides him while performing the Sadhana. Then he has to take one sand pebble and keep it in a Puja Thali and keep sprinkling water over the sand pebble while chanting the Vashikaran Mantra for One Mala. After the completion of One Mala, he has to throw away the sand pebble; the same procedure has to be repeated for the rest of the 40 remaining Malas. The Vashikaran Sadhana has to be commenced on a Pushya Nakshatra [the constellation Delta Cancri] or on any Swati Nakshtra [the constellation Arcturus], which falls on any Monday, or the Chitra Nakshatra [the constellation Spica Virginis –Vegus] which falls on a Sunday. Plz tell a few things about this sadhana. Firstly when would be the next day on which it can be commenced. secondly, have you seen anyone having success with this. and lastly does the purpose for which it is used have repercussions on the practitioner..
Guruji, I have a question. I practioned this mantra for about 20 days but then I stopped. Does that mean that I can never praction this anymore of do I have to start again?